Fracking ban lifted in the N.T. 18 Apr Fracking ban lifted in the N.T. Jemena has today welcomed the Northern Territory Government’s decision to lift the moratorium on hydraulic fracturing, following an extensive, independent, and robust 18-month inquiry which found the risks associated with unconventional gas development can be mitigated to acceptable levels or removed entirely. This places the Northern Territory in a better position to develop onshore gas exploration. Following today’s decision, Jemena intends to progress its plans to extend and expand the $800 million Northern Gas Pipeline (NGP). This work is expected to create around 4,000 jobs across northern Australia, with early estimates placing the cost of the project at around $3 – $4 billion. Jemena’s Managing Director, Paul Adams, commended the Territory Government’s decision, noting it had commissioned a thorough review into unconventional gas development that included broad and frequent consultation with the community. Mr Adams said the NGP will be completed in late 2018. 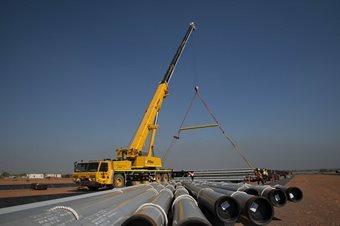 It will initially transport around 90 terajoules of gas, with the extension and expansion of the Northern Gas Pipeline having the potential to bring around 700 terajoules of gas – enough gas to meet the average daily domestic gas needs of Brisbane, Sydney, and Adelaide – to market. Jemena owns and operates a diverse portfolio of energy and water transportation assets across the east coast of Australia totalling $10.5 billion worth of major utility infrastructure, including the Queensland Gas Pipeline. Jemena is owned by the State Grid Corporation of China, and Singapore Power.